Driving to work this morning, the radio DJ (Yes. Sometimes I listen to the radio, like a grandma) was talking about David Bowie, and what he taught us about valuing people who are different. It got me thinking about the inherent value in difference. Diversity of Thinking and Building the Perfect Team seem to be the hot topics of 2016 so far and (awesomely) lots of those conversations are revolving around the idea that difference is something we should be actively hunting. Culture fit isn’t about sameness, it’s about finding the right recipe – the right mix of personalities, perspectives and ways of thinking – to make a team that fits together productively. We’ve talked about this before (here, here and here if you’re interested), and we’re seeing more people sharing this “same-same + different” message. In a Forbes article published last year, Erika Anderson painted a brilliant picture of how hiring for culture fit can actually make room for more productive, valuable diversity. She asked us to imagine a CEO, building a business based on the core belief that delighting customers and keeping things simple and efficient is the best path to success. Then she poses two scenarios. In one, the CEO hires a person who is super-smart, with exactly the right skill set, but who believes increasing profit is more important than customer service. In the other, the CEO hires someone who is also smart, but who shares the core values of the business – that delighting the customer and efficiency are the greatest things ever. In both scenarios, there’s room for diversity hiring – you could apply all kinds of different genders, ethnicities, backgrounds, lifestyles or ways of thinking to those characters, but our CEO’s chances of success in scenario two are much higher. Why? Well, if our awesome, extroverted, ex-circus performing, Fijian, lady software engineer joins a team full of people who all look and think and approach challenges differently, there’s bound to be the odd difference of opinion. This kind of conflict can be great – it breeds creativity. Productive disagreement is how you challenge the status quo and find new, innovative ways to approach challenges. The key is making sure the whole team trusts each other to be pulling toward the same goals, so you get the creative, “I’ve got a different idea that I think could work better” kind of conflict, not the “oh god this is so frustrating I can’t work with these people” kind. 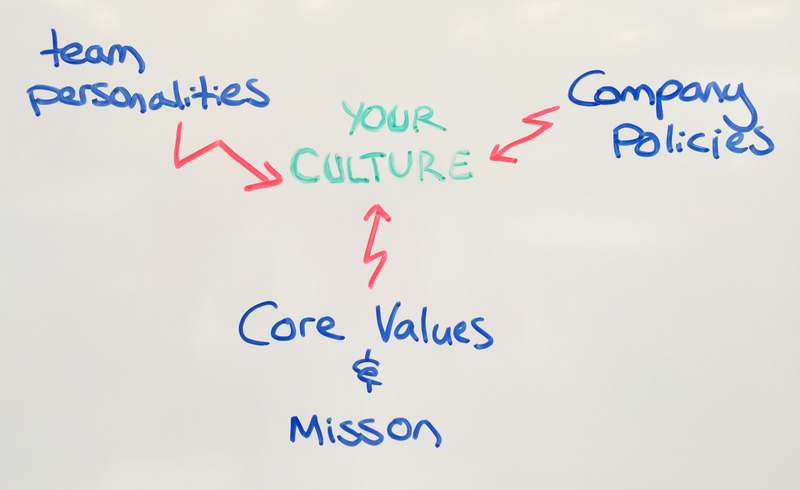 So how should we define culture? Culture is an organic structure. It’s the meeting point between your core brand values and mission, the combined force of individuals, your company policies. Your culture is kind of an evolving, living thing – the whole being impacted as each element changes and grows. As you hire new people and add new personalities to the group dynamic, your culture will evolve. You may adjust your policies as you grow – changing remote or flexible work-week structures, or shifting the way you address performance reviews. You might even revise your mission and brand values as you and your consumer market grow. All these little things affect each other, and, ultimately, help shape and evolve your culture. How do you know if someone’s a good fit? – The new person shares a passion for your mission. They care so much about the impact your business is trying to make in the world that they’re excited to spend hours every day working toward it. – They understand and are drawn to your brand – where you sit in your competitor market, what makes you different, and your core values. Some people are great at articulating this stuff, some not so much, and that’s cool. It’s more about getting a sense that they really get the brand and that they feel comfortable representing it in public. – Your company policies work with the way they like to live. (eg. do your structures mean you need people to be sitting in your physical office between 8:30 and 6? That’s cool. Someone who’s looking for a more flexible, remote working environment might not be for you). This is a tricky one. We all want to set policies that are totally inclusive, but you also need to be realistic about what your business and current team can handle at the moment. – They fit the skills gaps in your team that you need filled – whether those are hard or soft skills. This means they might throw a new perspective in with a team of people with awesome skills, but quite homogenous experience. Maybe you’ve got lots of process thinkers and you need someone a bit more conceptual and unstructured to shake things up and unleash your team’s creative potential. The highest performing teams in the world find balance. That means when they’re building teams, they’re looking for the right kind of difference, alongside the right kind of alignment. That’s the recipe we should be looking for when we’re building startup teams and creating diverse, creative, energetic companies. If you want to start walking the culture fit talk, adding a Weirdly quiz to your hiring process is an awesome way to do it.